This high quality Ace Casual Furniture rocking chair surrounds you in quality comfort and style, perfect for lounging after a long day. Its cozy leather upholstery and sturdy leather wood base rocking chair a terrific combination of style and durability. Relax and unwind the cottage-like, farmhouse outdoor space created by the Mill Valley Collection. The oversized seat cusions of the Mill Valley Fully Woven Patio Lounge Chair will add comfort and understated casual elegance. The texture and classic, traditional lines elevate the level of sophistication. Pair with other items in the Mill Valley Collection to complete the look. 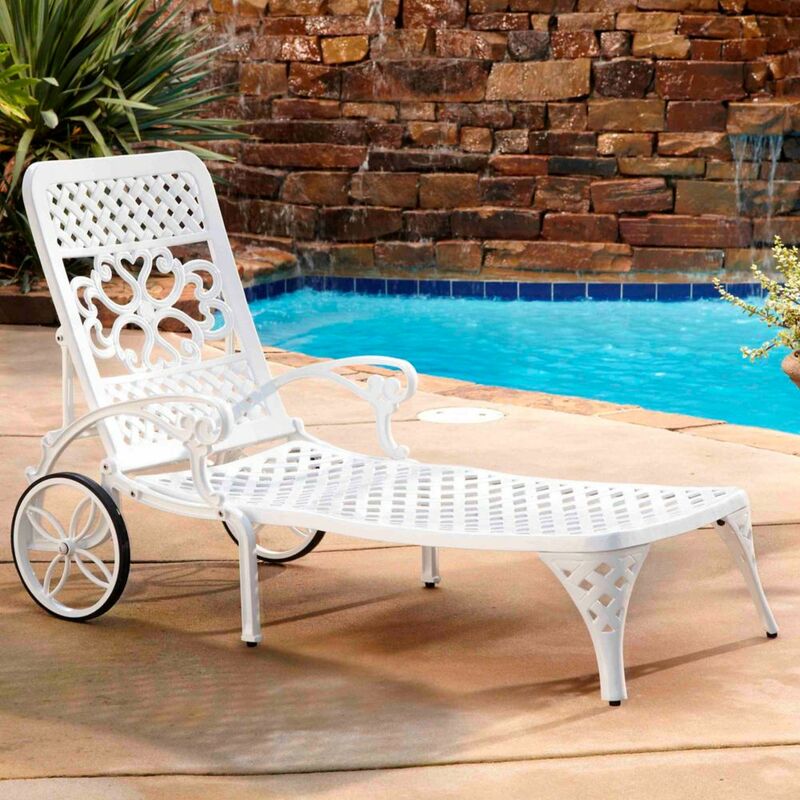 Escape to your very own backyard oasis with this beautiful lounge chair! You'll feel like your lounging by the hotel pool when you relax on the thick, plush cushions. A fully adjustable back lets you choose how best to relax while armrests on either side will make reading a book or magazine a more comfortable experience. The sleek, cleanly designed frame will be a handsome addition to any patio, deck, pool or other outdoor living area. Built from high quality aluminum this lounge chair is both rust-free and lightweight, making it an ideal choice for seating around the pool. Biscayne Chaise Lounge Chair in White is rated 4.0 out of 5 by 2. Rated 5 out of 5 by John OConnor from Return items these were great but did not match the table so we returned them. this was easy too. Rated 3 out of 5 by Lana from This Patio Chaise Lounge is very good looking and very... This Patio Chaise Lounge is very good looking and very comfy, but very poor quality! Some parts don't fit, it scratches very easily, and more over, part of the lounger was already scratched up (before opening). The look don't meet the quality. I was going to order second one, but now I'm not sure.